I have just finished reading a biography about the American-Japanese sculptor Isamu Noguchi. I had forgotten that Noguchi was also an innovative designer of furniture and his own line of Akari geometric/sculptural paper lamps, designed following his first visit in 1951 to Gifu, the Japanese city long associated with the traditional manufacture of bamboo and paper lanterns. I made a similar visit to Gifu in 1990 to see these paper lighting designs, many of which emanated from Noguchi’s originals. Targeting an export market, Noguchi’s first modernist lamps used flexible wire framing instead of bamboo strips and were lit by electric light-bulbs instead of candles. Noguchi’s fascination with light supposedly began when as a small boy living in Japan, he would say that he couldn’t sleep until he saw the moon. His father, later estranged from the sculptor, devised a light and shadow arrangement depicting the moon and seen by a young Noguchi through the dividing shoji screens of the adjacent room. Now on exhibition at the M+ Pavilion at the West Kowloon Cultural District is a selection of Noguchi’s sculpture and design items, alongside work by Danish-Vietnamese artist Danh Vo. My reading complete, I can now visit the M+ exhibition – details below! If you really want to get your head around a topic, issue, or, say, the life of a great artist, such as Noguchi, only a quality book, with details and facts and analysis – alongside seeing the actual art - will give it to you. In contrast, for the past weeks in the ‘papers I have been reading reviews of the recently concluded past year. Best books read, best eaten dishes, best films seen, best wine, travel surprises good and bad, musical highlights, political summaries, financial market predictions (always market predictions), exhibitions that excited (in the art world, “we are excited…!”, is a favoured exclamation). On the other hand, exhibitions not so good are rarely written about and just forgotten. However, too much space is devoted to restaurant reviews, especially of over-priced, over-hyped restaurants. How often do you read a review of a normal, no-frills place (except on Open Rice’s website)? One of my daily pleasures is having a simple breakfast of toast and coffee whilst reading a newspaper. I usually go to a local cha chan teng, of which there are about eight to choose from around Sheung Wan. However, my morning ritual on Saturdays starts a little later and is a sort-of brunch that invariably includes Beijing-style dumplings at the Queen Street Market or, sometimes, a sandwich. My award for best no-frills café that serves the best (and best-value) sandwiches, with a choice of different breads, in Hong Kong is Le Vélo. It is the sort of good no-frills local café you would find in Japan, including having a range of magazines and newspapers for customers to read. 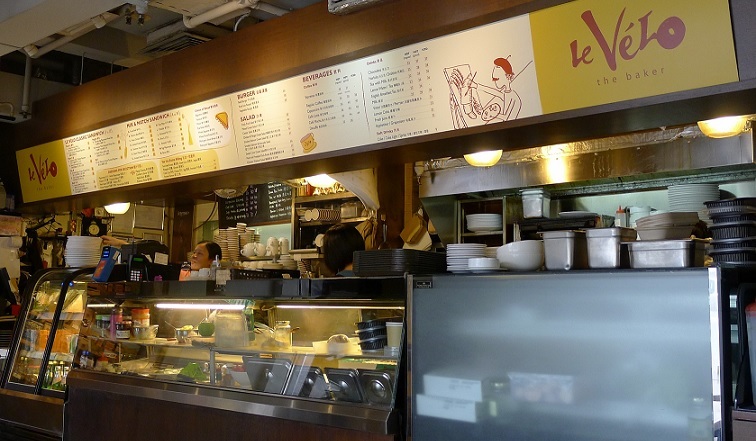 Le Vélo is located in that no-man’s land between Sheung Wan and Central on Connaught Road. So, if you walk towards Central after exiting the Sheung Wan MTR Station, past the rear of Wing On and Sincere Department Stores, and the China Travel office, and you arrive outside Hang Seng Bank, then you have missed it! It is worth doubling-back again, the sandwiches are good! A nice slice of toast and coffee and reading. That’s a good morning! This article was originally published in Ming Pao Weekly, 5 January 2019. Translation from English to Chinese: Aulina Chan.